PLAINVIEW, NY--(Marketwired - May 19, 2016) - NeuLion, Inc. (TSX: NLN), a leading technology product and service provider specializing in the broadcasting, distribution and monetization of live and on-demand digital video content to Internet-enabled devices, today announced a new multi-year agreement with ELEVEN SPORTS NETWORK, and is proud to announce the launch of a new digital service for all sports fans in Belgium, Luxembourg, Poland, Singapore and Taiwan. From 18 May, fans can access LIVE and on demand premium sports content such as UEFA EURO 2016, Liga BBVA, Formula 1® or NBA, anytime, anywhere on their tablet, mobile or laptop devices via the fresh and expanded ELEVEN SPORTS service, available via subscription both online and as an app. Powered by the NeuLion® Digital Platform, ELEVEN SPORTS subscribers can enjoy new features including a Catch Up option, allowing them to watch any LIVE sport or programming shown on the network's channels in the past 24 hours, meaning they should never miss a moment of exhilarating action, no matter what time zone they are in. This is complemented by Video On Demand (VOD), providing viewers with the flexibility to watch clips and short form highlights of the very best action whenever they like, and the additional functionality to pause and rewind LIVE coverage of the biggest sports events from around the world. 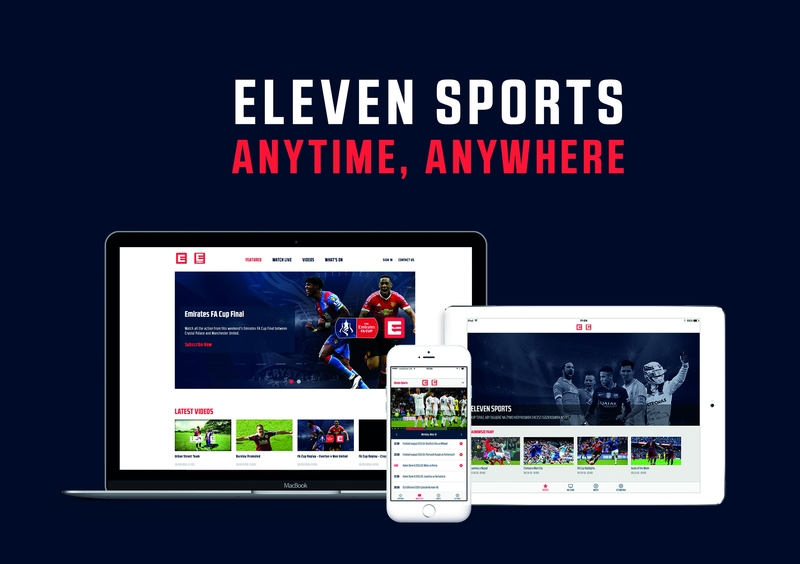 "We are extremely excited to launch our new ELEVEN SPORTS digital service at a time when fans continue to look for the best and most convenient ways to watch sport," says Danny Menken, Group Managing Director, ELEVEN SPORTS NETWORK. "Working with NeuLion has enabled us to offer viewers a best in class service which we are sure they will be delighted with. Our fantastic range of world-class sports deserves to be showcased on a platform like this and enjoyed by as many people as possible." "Our experience and expertise delivering live sports throughout Europe and Asia for big brands including the NFL, NBA, UFC and others has allowed us to continue to land fantastic new partners," says Kanaan Jemili, CEO, NeuLion. "We are excited to team up with ELEVEN SPORTS NETWORK and give their fans an enhanced digital experience delivering great content on multiple devices." Launched ahead of this weekend's Emirates FA Cup Final on Saturday 21 May, all football fans in Belgium, Luxembourg, Poland, Singapore and Taiwan can enjoy EXCLUSIVE coverage of the clash between Manchester United and Crystal Palace via the ELEVEN SPORTS platform, either LIVE or by Catch Up the following day. This summer, football fans in Singapore will be treated to LIVE and EXCLUSIVE UEFA EURO 2016 action, with every match from the tournament available via the ELEVEN SPORTS service. Subscribers in Poland can follow every race from the 2016 FIA Formula One World Championship™ and football from the world's leading pre-season club competition, the International Champions Cup, this summer, while fans in Belgium can catch action from the NBA Finals and viewers in Taiwan can enjoy tennis from the ATP 250 Tour. Depending on the country, subscribers will additionally have access to football from top leagues and cup competitions including Spanish Liga BBVA, Italian Serie A TIM, Emirates FA Cup, Capital One Cup and English Football League, French Ligue 1, Campeonato Brasileiro Série A, Scottish Professional Football League and 2018 FIFA World Cup Russia CONMEBOL qualifiers, as well as British Speedway, Velux EHF Champions League handball, kickboxing, MMA, badminton, table tennis and cycling events from around the world. 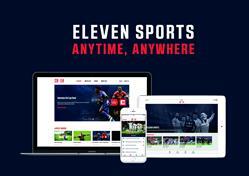 The ELEVEN SPORTS service offers flexible pricing options to fans in Belgium, Luxembourg, Poland, Singapore and Taiwan, and is available online or as an app that can be downloaded from Google Play. The app is already available on the App Store in Belgium, Luxembourg and Singapore, with imminent availability in Poland and Taiwan. NeuLion, Inc. (TSX: NLN) offers solutions that power the highest quality digital experiences for live and on-demand content up to 4K on any device. Through its end-to-end technology platform, NeuLion enables digital content management, distribution and monetization for content owners worldwide including the NFL, NBA, World Surf League, Univision Deportes, Euroleague Basketball and others. With the recent acquisition of DivX, LLC, NeuLion also operates a robust consumer electronics licensing business that has enabled over 1 billion devices worldwide with secure, high-quality video playback, and delivers a DivX consumer software offering that has been downloaded over 1 billion times. NeuLion's customers include major sports, entertainment and global content companies as well as major consumer electronics manufacturers and software companies. NeuLion is headquartered in Plainview, NY. For more information about NeuLion, visit www.NeuLion.com. Founded in 2015, ELEVEN SPORTS NETWORK is a brand new global sports network dedicated to delivering world-class international and domestic sports and lifestyle entertainment. Initial launches include multiple channels across select domestic markets with each country receiving between 2,500 and 3,500 hours of live coverage of premium sporting events annually, along with news, comprehensive analysis, digital content and local programming. The pay TV channels are 24/7, multiscreen, full HD and locally produced to the highest international production standards, with local language commentary. Certain statements herein are forward-looking statements and represent NeuLion's current intentions in respect of future activities. Forward-looking statements can be identified by the use of the words "will," "expect," "seek," "anticipate," "believe," "plan," "estimate," "expect," and "intend" and statements that an event or result "may," "will," "can," "should," "could," or "might" occur or be achieved and other similar expressions. These statements, in addressing future events and conditions, involve inherent risks and uncertainties. Although the forward-looking statements contained in this release are based upon what management believes to be reasonable assumptions, NeuLion cannot assure readers that actual results will be consistent with these forward-looking statements. These forward-looking statements are made as of the date of this release and NeuLion assumes no obligation to update or revise them to reflect new events or circumstances, except as required by law. Many factors could cause NeuLion's actual results, performance or achievements to be materially different from any future results, performance or achievements that may be expressed or implied by such forward-looking statements, including: our ability to derive anticipated benefits from the acquisition of DivX; our ability to realize some or all of the anticipated benefits of our partnerships; general economic and market segment conditions; our customers' subscriber levels and financial health; our ability to pursue and consummate acquisitions in a timely manner; our continued relationships with our customers; our ability to negotiate favorable terms for contract renewals; competitor activity; product capability and acceptance rates; technology changes; regulatory changes; foreign exchange risk; interest rate risk; and credit risk. These factors should be considered carefully and readers should not place undue reliance on the forward-looking statements. A more detailed assessment of the risks that could cause actual results to materially differ from current expectations is contained in the "Risk Factors" section of NeuLion's Annual Report on Form 10-K for the fiscal year ended December 31, 2015, which is available on www.sec.gov and filed on www.sedar.com. About this company NeuLion, Inc. The enhanced service, powered by the NeuLion Digital Platform, is available on multiple devices anytime, anywhere. The NeuLion® Digital Platform provides digital video broadcasting, distribution and monetization of live and on-demand sports and entertainment content to any connected device. NeuLion's technology powers the digital experience for leading brands around the world, delivering the highest quality video, up to Ultra HD/4K, with advanced interactive features for consumers globally. NeuLion's next-generation platform for the delivery of high-quality live and on-demand video.